Doha, Qatar, 29 July 2018: Ooredoo Q.P.S.C. (“Ooredoo”) - Ticker: ORDS today announced results for the first half of the year ended 30 June 2018. Ooredoo Qatar became the first operator in the world to launch a live 5G network on the 3.5GHz spectrum band. The Ooredoo 5G service offers the latest network technology (5G NR), meaning much higher speeds, capacity and better latency than existing cellular systems. Ookla’s Speedtest Intelligence recognised Ooredoo Myanmar as the fastest 3G/4G network in Myanmar, Ooredoo Oman and Ooredoo Algeria were recognised as the fastest mobile network in the country. Ooredoo launched a new “Enjoy the Internet” campaign featuring Leo Messi, Ooredoo’s global brand ambassador and one of the world’s top football stars. In a series of immersive videos, viewers across all of Ooredoo’s key markets are shown a playful side of Leo Messi who demonstrate how much fun can be had off the pitch in the digital world. “Ooredoo Group is at the forefront of telecom innovation globally and I am proud to announce that we are the first operator in the world to launch a live 5G network during the first half of 2018. The new technology brings with it a raft of new possibilities that were simply not possible before 5G and will enable businesses and consumers to unlock more of their potential and prosper in a digital world. We remain true to our mission of enriching people’s digital lives. During the period, Ooredoo and Leo Messi teamed up once again in a lively campaign to take our customers off the pitch and into a digital world. The integrated “Enjoy the Internet” campaign, brought to life the power of our network and the variety of digital content. “The first half of 2018 saw a mixed set of re­sults across our operations, with strong performances in Iraq, Tunisia and Oman, being more than offset by challenging market conditions in Indonesia and Algeria as well as by FX losses in Myanmar. Group Revenue was QAR 15.3 billion and EBITDA margin stood at 41%. Ooredoo Group delivered a Net Profit of QAR 689 million. We have seen Revenue increases in Iraq, Oman, Kuwait, Tunisia and Myanmar. 4G networks are now available in 8 of our 10 markets. In Qatar, we launched the world’s first 5G network. We defended our market leadership position in our domestic market as well as in Tunisia and Iraq. Our focus on efficiencies resulted in a sequential improvement of our margins. Ooredoo Qatar reported revenue of QAR 3.9 billion (H1 2017: QAR 4.0 billion) in the first half of 2018, while EBITDA was stable at almost QAR 2.0 billion. Lower mobile voice and roaming revenues were partially offset by strong performance in corporate ICT sales, following multiple new product launches e.g. the new Fleet Management Services in Qatar. Customer numbers stood at 3.3 million. The company delivered outstanding progress in network modernisation in the first half of the year, becoming the first operator in the world to launch a live 5G network on the 3.5 GHz spectrum band in May 2018. 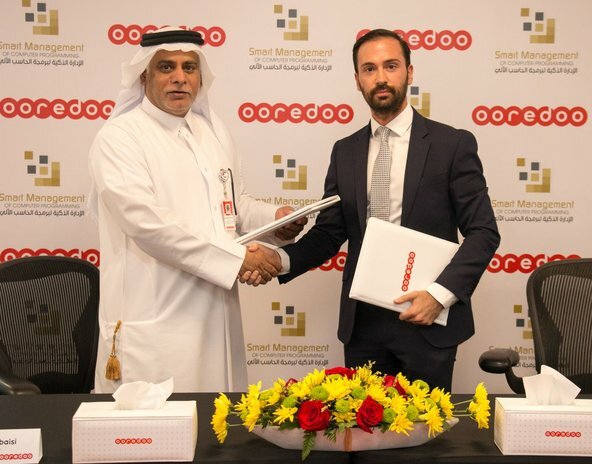 Ooredoo Qatar added new 5G sites and also brought the world’s first live 5G home broadband device to Qatar during the period. To showcase the power and potential of 5G services, the company successfully demonstrated three futuristic “smart stadium” applications during the final of the Emir Cup in May. As part of its drive to maintain and build data market leadership, Ooredoo Qatar revamped its post-paid portfolio and added new business services in H1 2018. Ooredoo Oman delivered a robust set of results with growth across the board. Revenues increased by almost 3% to reach QAR 1.4 billion in H1 2018, driven by mobile and fixed data revenues. EBITDA grew by almost 3% to QAR 711 million in H1 2018, reflecting efficient management of costs. Ooredoo Oman’s customer base stood at 2.9 million in H1 2018 compared to 3.1 million last year, the slight decrease was driven by the standardization of welcome pack offers by the operators based on the guidance from regulator. Ookla’s Speedtest Intelligence, the global leader in internet testing and analysis, awarded Ooredoo as the Fastest Mobile Network in Oman for H1 2018. This award recognises the tremendous achievements of our technology team to enable a better data experience for Ooredoo customers. Ooredoo Kuwait reported a strong revenue growth of 23% in H1 2018 Revenue to QAR 1.5 billion mainly driven by non-recurring revenue. The company’s focus remains on digitization and continued growth in its B2B service offering despite a highly competitive marketplace. While higher handset sales contributed to the increase in revenue, they negatively impacted margins. EBITDA was QAR 294 million in H1 2018, lower than QAR 322 million in H1 2017 also impacted by intense price competition. Ooredoo's customer base in Kuwait increased by almost 5% to 2.4 million in H1 2018, up from 2.3 million in H12017. During the second quarter, Ooredoo Kuwait’s brand equity score improved reflecting increased customer satisfaction. Asiacell Iraq maintained its mobile revenue leadership and delivered good results for the first half of the year. Revenues increased by more than 3% to almost QAR 2.2 billion in H1 2018. EBITDA was up 10% to QAR 1.1 billion, growing at a faster rate than Revenue and reflecting good cost management. Customer base increased 7% to more than 13 million customers at the end of H1 2018, as the restoration of the network sites in the liberated areas progressed further. Ooredoo Algeria maintained mobile data leadership during H1 2018, despite challenging market conditions. Revenues for H1 2018 were QAR 1.4 billion compared to revenues of QAR 1.7 billion for the same period in 2017, negatively impacted by devaluation of the Algerian Dinar, a weak economic environment and intense competition. EBITDA was QAR 557 million in H1 2018, down from QAR 778 million in H1 2017. Ooredoo’s customer base in Algeria stood at 13.6 million customers at the end of H1 2018 (H1 2017:14.0 million), with continued growth in data users. Ooredoo Algeria is the first mobile operator to bring 4G to all the 48 wilayas of Algeria and its 3G and 4G networks continue to be ranked number one in the country. Ooredoo Tunisia reported a robust set of results with growth across all key indicators. Revenues increased by almost 4% to QAR 771 million in H1 2018, in local currency terms the increase was even stronger at 8%. Growth was driven by mobile data and VAS revenues as well as fixed revenues and handset sales. This is in line with the company’s strategy to focus on data and VAS revenue generation to offset the decline of voice and SMS, an industry -wide challenge. EBITDA increased by 6% to QAR 293 million compared to QAR 278 million for the same period in 2017. Ooredoo remains the market leader with more than 40% of mobile market share. Ooredoo Tunisia’s customer base increased to 8.4 million in H1 2018, up 5% compared to the same period in 2017. As expected, the new regulation requiring SIM card registrations in 2018 and a change from a “push” to a “pull” distribution strategy continued to impact our performance with a 22% decrease in our customer base in H1 2018. The top line was squeezed by this development and the market trend of declining voice and SMS not offset by data revenue. Revenue for the half year stood at QAR 2.9 billion, down 29% compared to the same period last year. Consequently, EBITDA decreased to QAR 1.1 billion in 1H1 2018 (1H2017 QAR 1.9 billion). Indosat Ooredoo made significant headway with its cost optimization initiatives. Total expenses decreased 10% during the first half of the year, compared to the same period last year. Indosat Ooredoo’s policy is to ensure strict compliance with market rules and regulations. The new SIM card regulation was implemented in a phased manner and completed by May 2018. Indosat Ooredoo sees long term opportunities in the new market environment with a more loyal customer base, with lower churn rates that will lead to higher margins in future. Looking ahead, we are cautiously optimistic and expect top-line growth to return in the second half of 2018. Ooredoo Myanmar reported another strong set of results, supported by solid growth in data and digital revenues and new customer additions. Customer base improved to almost 9.4 million customers, up more than 12% in H1 2018 compared to H1 2017. Revenues were up 19% to QAR 742 million as compared to the same period last year, driven by the data and digital segments, EBITDA for the first half year was QAR 130 million, up from QAR 44 million compared to the same period last year, fuelled by the successful implementation of the efficiency program and revenue growth. EBITDA margin improved from 7% to 17% year on year. 4G coverage was extended to almost 250 townships, the network was recognised as the fastest 3G/4G network in Myanmar by Ookla’s Speedtest Intelligence. Through smart partnerships and innovative launches, Ooredoo Myanmar increased its customer base and user engagement. Another highlight for the period, Ooredoo Myanmar is the exclusive telecom partner for “Myanmar Idol 2018,” with all audience voting taking place by SMS on Ooredoo’s network. On June 9, 2018, Mytel entered the market as the fourth operator and launched nation-wide 2G and 4G services in Myanmar. Ooredoo’s Q2 2018 financial statements will be available on its website, accessible at: http://www.ooredoo.com.